Two weeks of sore legs, unpredictable weather and countless punctures may sound like a nightmare for some, but the rewards of the LEJOG cycle has seen it grow into one of the most popular and famous cycle challenges in the UK, and even the world. Traversing 874 miles (though more likely to be around 1,000 miles for cyclists who want a more cycle friendly or scenic route), from the most south westerly point of the UK, Lands End, to its north eastern equivalent, John o’ Groats, the epic ride takes most cyclists ten to fourteen days. Most organised rides are now done as a challenge to raise money for charity, but there are still large numbers of cycling enthusiasts who take on the route for fun, and it’s a great way to discover the United Kingdom in all its glorious variety. The classic LEJOG route takes in the sandy beaches and fishing villages of Cornwall, the rolling hills and medieval towns of Shropshire, the natural beauty of the Lake District, the rugged countryside of Lancashire and Yorkshire Dales right up to the lochs and mountains of the unspoiled highlands. It can be a punishing ride, but the rewards, both physical and mental, make it completely worth it. 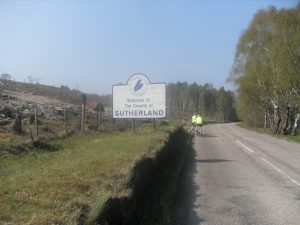 The LEJOG ride is so popular because it’s a wonderful way to escape the hustle and bustle of modern living and go on an outdoor adventure to really help you connect (or reconnect) with the freedom of flying across country on your bike. Everyone who does the LEJOG cycle completes it with a few stories to tell, from nightmare climbs to making new friends on the route, and each journey comes with its highs and lows, but every LEJOG rider will tell you it’s a truly fulfilling experience. 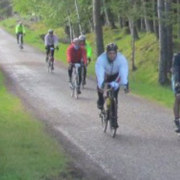 The LEJOG cycle also raises thousands for charity every year and completing it in less than nine days is seen as one of Britain’s toughest sporting achievements for those that relish a challenge! The current cycling record is 44 hours if you REALLY want to push yourself! 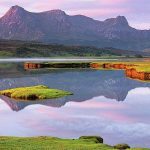 Town and villages that are on the LEJOG route are often home to budget accommodations for weary cyclists, and with Altnaharra being seventy miles from John o’ Groats (that’s a day’s cycle at an average pace with a few coffee and snack breaks thrown in! ), it’s an ideal stop for those about to start their last day cycling or those about to finish their first day if they’re travelling towards Cornwall. Our log cabin is simple and low cost and we can include a hearty Scottish breakfast to help you with your energy levels in the morning! We also provide secure lock ups for cycles and a drying room to refresh any wet clothes. If the LEJOG cycle sounds like your kind of challenge, if you’re beating the clock or taking a more leisurely pace, Altnaharra is an ideal stopover to rest your muscles and recharge your batteries!